Sweet and savory, these baked chicken wings will have the whole family licking their fingers and asking for more. Giora Shimoni, who grew up eating chicken wings, says he'd pretty much forgotten about them by the time he was cooking for his own kids. But a visit to a friend changed all that -- it turned out that "Jo's Kids' Favorite Chicken Wings" were a resounding success with his own kids, too. So he started making this recipe for them, to quiet their constant begging for the deliciously sticky-sweet wings. For a sweet finish, offer fresh clementines, or this Tropical Mango Upside Down Cake. Serving these wings as party fare? Offer them with other small bites, like Two-Way Sloppy Joes, which can be made with either meat or a vegetarian ground beef substitute, and served on slider buns as well. Baked Chickpea Fritters make great finger food, too; serve them solo, or with homemade hummus for dipping. And the Asian cuisine-inspired flavors in these Chicken and Scallion Wontons with Soy Dipping Sauce would make a great complement to the Sweet Soy Chicken Wings. Clean the chicken wings well, making sure all feathers are removed. Place the wings in a large ziploc bag or a deep rimmed dish. Set aside. In a small bowl, mix the soy sauce, brown sugar, honey, garlic, sherry and ginger. Pour the sauce over the chicken, and mix so that all pieces are coated. Seal the bag or cover the dish, and marinate in the refrigerator for a few hours or overnight. Preheat the oven to 400° F (200° C). Generously oil a baking dish large enough to hold the wings in a single layer. Or, spray liberally with non-stick cooking spray. 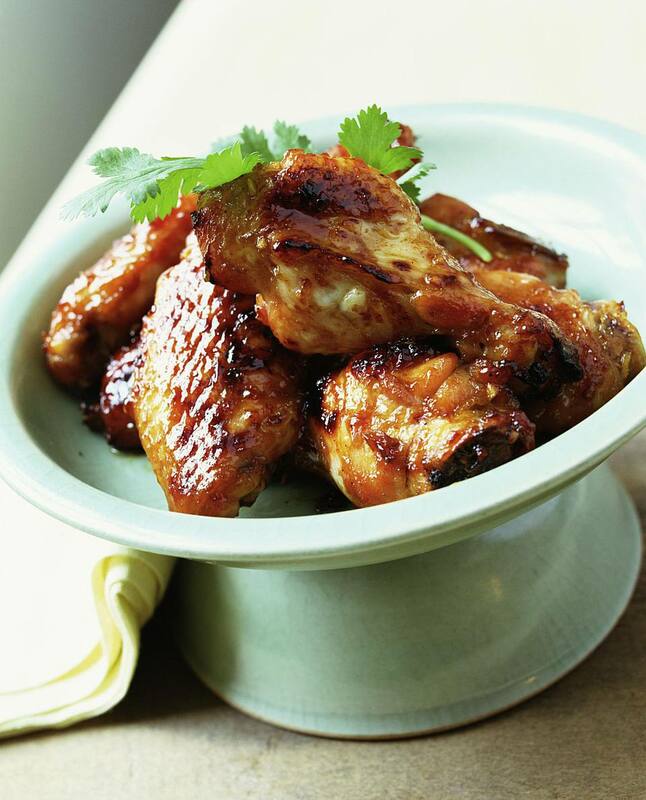 Place the marinated wings in a single layer in the baking dish. Bake, uncovered, in the preheated oven for 30 minutes. Turn the wings over, then return to the oven and bake for another 30 minutes, or until the chicken is cooked through.